ShutterstockInside one of the 14 tents. 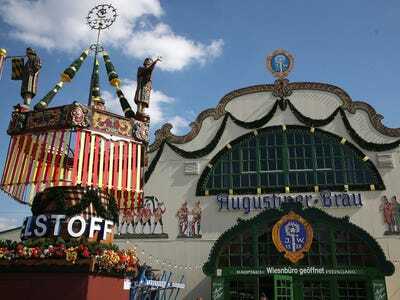 Oktoberfest is the world’s largest beer festival, and the parties take place inside enormous tents. 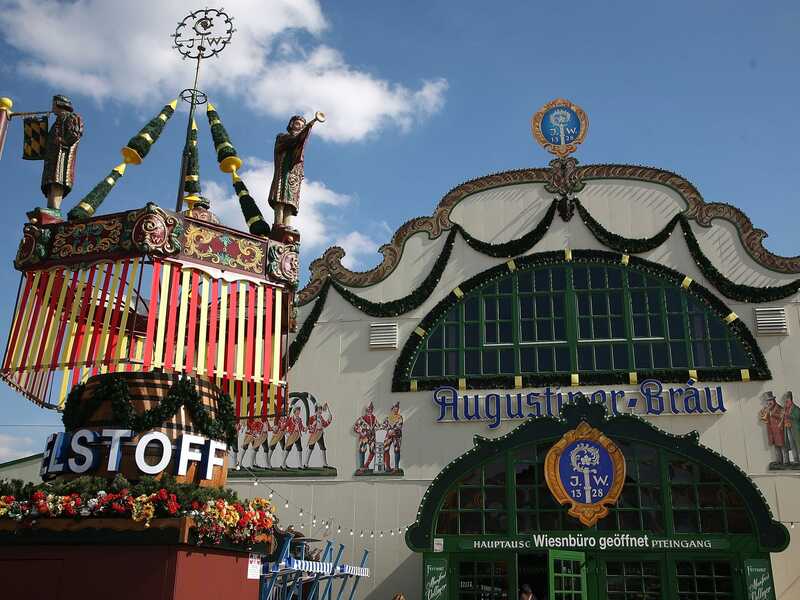 The festival, which locals call Wiesn, has 14 main tents, each able to fit between 5,000 and 11,000 people, and each rocking a wholly different vibe. Some tents are more family oriented, others more focused on the food, others again known for their high concentration of tourists. Most serve tons of beer, meats, and other Bavarian delicacies, and one only serves fish. Know which tent is the right one for you before you go. 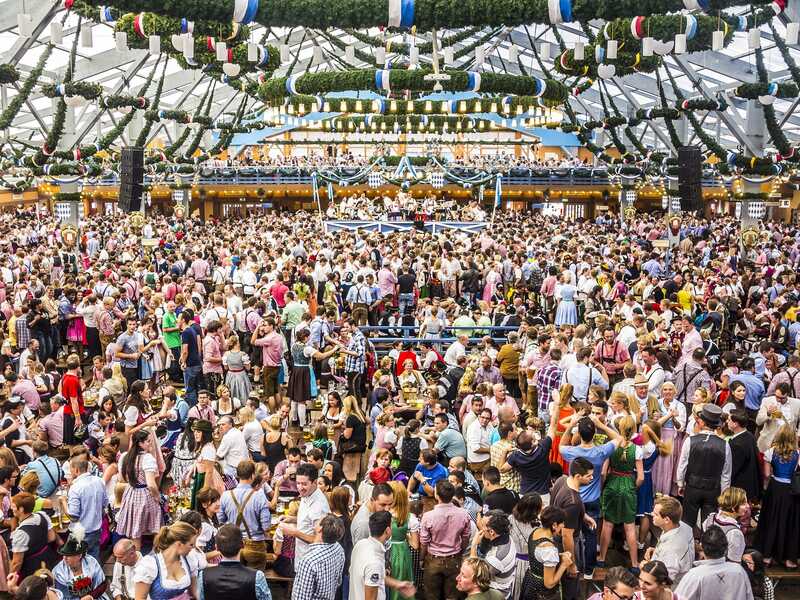 Here’s a guide to each Oktoberfest tent. Owned by one of Munich’s most famous restaurateurs, this relatively small tent serves incredible, and incredibly expensive food. The tent is famous for its roast duck, and thus the go-to for gourmands and Munich’s creme de la creme, as well as local and international celebrities. It’s open later than the rest of the tents, but can be tough to get into unless you have a famous last name. On the smaller side and off the beaten path, as in not on the main road, this is one of the more Bavarian tents, and generally filled with Munich locals of all ages. It’s a pretty party heavy tent, and features 100 shooting stands in the back. One of the largest tents, fitting 11,000 people, this one is a colourful mix of old and young, and easily recognisable by its 80-foot tower featuring a giant mass of beer. Allegedly, it’s the FC Bayern team’s favourite. This is the oldest tent at Oktoberfest (since 1867), and where the mayor taps the first keg. A lot of young locals frequent this tent — and by young we mean young, since the legal drinking age is 16. The ceiling here is decorated with a dramatic “Bavarian sky” (white and blue), which was built by an Oscar-winning set designer, and can be partly opened when it’s sunny. This tent is another local favourite, skewing towards the younger set, but also has a solid international crowd. It’s a little more calm during the day than other tents, but gets rowdy around 7pm. This super traditional tent, one of the largest with 10,000 seats, is a tourist fave, known for the many different countries represented among its guests. Another local favourite, and said to be like a little folk festival, this one is both a very traditional tent and one that’s party-focused, with guests of all ages. It also features an annual crossbow competition that attracts archers from all over Germany, and has a shooting range in the back. The beer here still comes out of traditional wood kegs, and is said the be the best. This tent is usually filled with regulars — in fact, there are a whopping 200 tables reserved for regulars. Avoid Tuesdays, as these are meant to attract familys with special kids prices. One of Munich’s most famous beers, you can’t go wrong at Löwenbräu, though it skews towards an older local crowd. The entrance is easily recognisable, as a large lion flanks its doors — loudly growling “Löwenbräu” every so often. It’s also known as the meeting place for Munich’s TSV 1860 soccer fans. One of the newest tents, this one is family friendly, at least during the day, and has diaper changing stations and enough room for strollers. As the name implies, this tent serves mostly wine and champagne. Instead of beer benches it has normal tables and seats with seat backs, and feature three different live bands. One of the smallest tents, this one specialises in fish, and attracts an older audience. It also features a huge LGBT party on the second Monday. The name translates to ox grill, so don’t be surprised to find entire oxes turning on a spit. This tent is pretty relaxed and full of regulars more focused on a good meal than anything else.